340-05-0002 - Skunk2 Timing Chain Tensioner - Pann Auto Performance - San Diego largest aftermarket automotive performance parts - What do you drive? Honda isn’t perfect. As good as its K-series engine is, its tensioner has its problems. 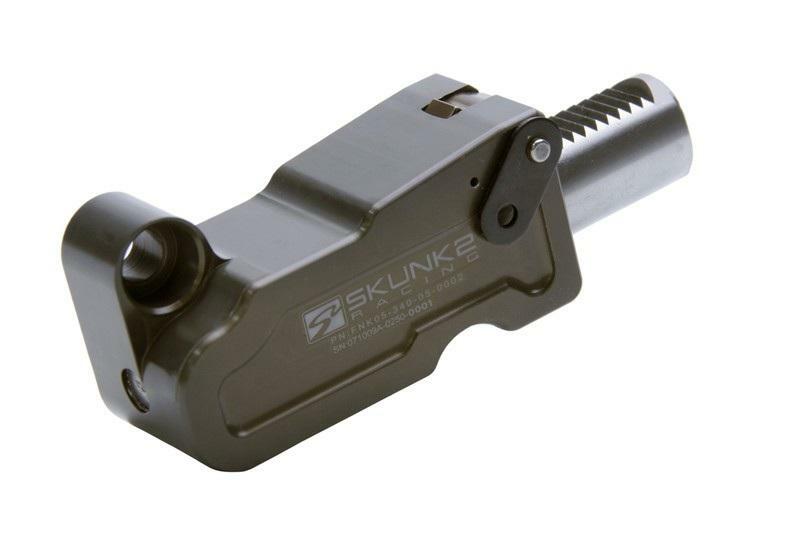 But Skunk2 has the solution – its Pro Series Timing Chain Tensioner. It’s never been safer to run big cams in your K.
Timing chain tensioners are simple but important. Take Honda’s K-series, for example. The crankshaft keeps the intake side of the chain tight but it’s the tensioner’s job to do so for the exhaust side. Without it, the cams would start spinning but ultimately just sit there doing nothing. Honda’s design incorporates both spring pressure and engine oil pressure. At low engine speeds, when oil pressure is low, the tensioner’s internal spring moves its piston toward the timing chain guide, reducing chain slack. As engine speed and oil pressure rise, the spring relaxes and oil pressure pushes against the piston. But Honda’s spring doesn’t always work as you’d expect, and excess tensioner piston travel and timing chain slack when oil pressure is low is common – especially during start-up when the spring is left to control the exhaust cam slamming shut all by itself. All of this can lead to engine damage, even on unmodified engines. Worst of all, you’ll never know any of this is happening until it’s too late. The problem is intensified once camshafts with aggressive closing ramps and/or stiffer valve springs are added. When the exhaust valves close while idling or during start-up, the tensioner’s piston slams back toward its housing, which causes its teeth to bash against its ratcheting mechanism. This isn’t a good thing since the ratchet and piston teeth are the only things that prevent the piston from being pushed in too far, which would otherwise lead to a dangerously loose timing chain that can potentially jump teeth, so keeping it intact becomes even more important. Once the piston’s teeth wear down, the safety mechanism’s gone. Meanwhile, as the tensioner’s spring struggles to resist the exhaust camshaft’s closing motion, the timing chain continues to slack, which is obvious by its kinking in the upper region near the camshaft gears. All of this is caused by a spring that’s too weak to counteract the exhaust valves slamming shut and weak, undersized piston teeth that wear from repeated bashing against their ratcheting mechanism. Until now, the solution was to “add a click” to the OEM tensioner, which reduces tensioner piston travel but doesn’t solve the overall problem. Stiffer springs have also been experimented with, but neither solution addresses the bashing effect and potential for worn piston teeth. Skunk2’s K-series Timing Chain Tensioner fixes all of this. Pro Series Tensioners are machined from high-quality 7075-aluminum, heat-treated, and feature stiffer, OEM-quality springs that prevent the exhaust camshaft from slamming shut at low engine speeds and eliminate chain slack, even under low oil pressure conditions where the factory spring would have been compromised. 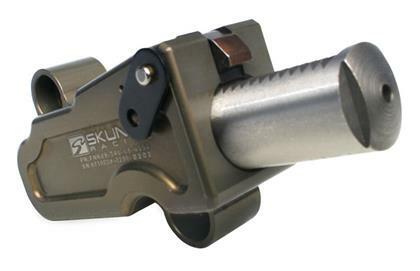 Skunk2’s tensioner also includes an upgraded 16mm diameter piston (1.5mm larger) with a larger ratcheting mechanism featuring deeper and wider, hardened-steel ratcheting teeth for extra protection – the ultimate fail-safe to ensure against excessive piston travel due to worn teeth. Skunk2’s tensioner also fits tightly against the timing chain guide to ensure against rotational movement, which can exert uneven load against the ratcheting teeth. Even the factory-designed oil passages and check valves are retained, which means the tensioner remains lubricated and pressurized just as Honda intended.